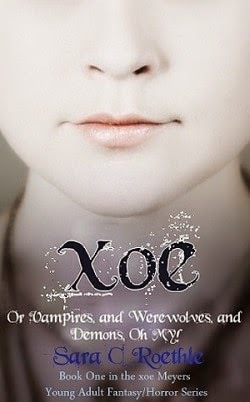 Today we are interviewing Sara C. Roethle, author of the YA Paranormal novel "Xoe." Sara C. Roethle is a full time author and part time unicorn. She lives in the Land of Enchantment, as far away from civilization as possible...while still having internet. This book is intended for teens and young adults, but is suitable for all audiences. What drew you to the YA paranormal genre? I've always enjoyed reading YA paranormal, so it was natural that I would write it. I like that I can have a bit of fun with it, and try to focus a little more on humor than drama. It's enjoyable and interesting writing characters who don't fully know who they are yet. Tell us a bit about the protagonist, Xoe Meyers. Xoe is a bit of a firecracker. She's stubborn, and sometimes a little rude, but she's also loyal and will do anything she can for her friends. Can you describe what this book’s creative process was like, from initial idea to published book? This was probably the book that took me the least time to write, which is surprising since it was my first. I was at an antisocial phase in my life, and writing “Xoe” took the place of the massive amounts of reading I was doing at the time. I had no initial idea, and actually thought I would never publish. I just sat down and wrote every day, then suddenly I had a book. I love the humor and wit that Kim Harrison and Laurell K. Hamilton bring to their writing. It's like something super serious can be happening, then suddenly you burst out laughing at something one of the characters had to say. Though I'm an avid reader, Kim and Laurell's styles have always inspired me. I actually just released the first book in a new series, “Tree of Ages”. It's going to be an epic fantasy series, more aimed at adults. “Xoe” is free to download on all platforms! "While we waited for Lucy to shower, I worried over Lucy’s new affliction. I also worried about the vampire sitting next to me on the sofa and the werewolf lounging on the love seat. Not to mention that tonight I had to sneak said vampire and werewolf into my house while we waited to be attacked by another werewolf. Since when was being a teenager so complicated?